A new palaeogenetic study demonstrates that the dromedary (also known as the Arabian camel) was domesticated some 3000 years ago, and indicates that the initial phase of the process took place on the shores of the Persian Gulf. According to a new study, the dromedary is a relative newcomer to the ranks of domesticated animals. The process of domestication can be dated to the second millennium BCE and most probably occurred in the southeast of the Arabian Peninsula. These are the principal findings of a genetic analysis that compared ancient DNA isolated from camel bones recovered from archaeological excavations with DNA obtained from modern camel breeds. The study, which appears in the “Proceedings of the National Academy of Sciences” (PNAS), was carried out by an international team of researchers led by Pamela Burger of the University of Veterinary Medicine in Vienna. Professor Joris Peters, Chair of Palaeoanatomy, Domestication Research and the History of Veterinary Medicine at LMU, made an important contribution to the work, as he explains in the following. For the palaeogenetic investigations the researchers analyzed ancient camel bones recovered from several prehistoric archaeological sites, including Bronze Age Al Sufouh in Dubai. “These finds provided the key that enabled us to unlock the hidden history of the domestication of the dromedary,” says Peters. Much to the team’s surprise, this history begins in a coastal setting in the southeast of the Arabian Peninsula. “The camels we all associate with arid landscapes came down to the coast in search of pasture. Above all, they needed salt, which is essential to their well-being.” – And salt was available in abundance along the coast of the Persian Gulf, which at that time was fringed with mangroves and habitats rich in salt-tolerant plants. Where the animals congregated, they also provided a welcome food source for the Bronze Age population of the area. At Al Sufouh alone, archaeologists have excavated over 17,000 camel bones. 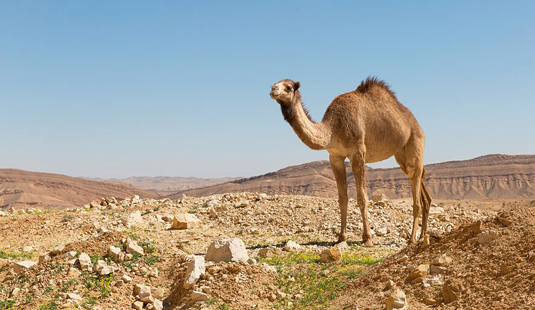 “This is a site where wild dromedaries were hunted and butchered,” says Peters, who is also a member of the Board of LMU’s ArchaeoBioCenter and is affiliated with the Bavarian State Collection for Anthropology and Palaeoanatomy in Munich. Back in the laboratory at the ArchaeoBioCenter, Peters and his colleagues were able to isolate and amplify ancient mitochondrial DNA from the bones. They compared the ancient mitochondrial sequences with those obtained from over 1000 modern dromedaries belonging to different breeds and originating from various regions across the modern geographic range of the species. “Our analysis of the mitochondrial genomes of modern-day camels confirms that the earliest known domesticated individuals from the southeastern Arabian Peninsula and their present-day descendants are closely related genetically. On the basis of the archaeozoological findings, we can date the beginning of the domestication process to the period between 1500 and 1000 BCE,” says Peters.